As part of our ongoing research into the best coffee makers out there, we tested the Hamilton Beach coffee maker. This machine has no carafe which makes it unique in the drip coffee maker world, and is a handy innovation that means there’s no risk of spillages or breakages. But does it work as well as it’s more conventional counterparts? One hand dispensing: The lack of a carafe means you just pop your cup under the dispense spout and dispense your coffee one cup at a time. Versatile brewing options: You can choose from regular brewing, bold brewing for a stronger flavour, and iced coffee. You can also choose to brew a small batch of one to three cups. Automatic shut off: This ensures you never again forget to turn your machine off, wasting power and costing you money. You can choose to set the automatic shut off from one to four hours. If you want to use the reusable filter, then choosing option three will save you around a dollar. It’s up to you to decide whether an extra two cups per brew is worth fifteen dollars or not! 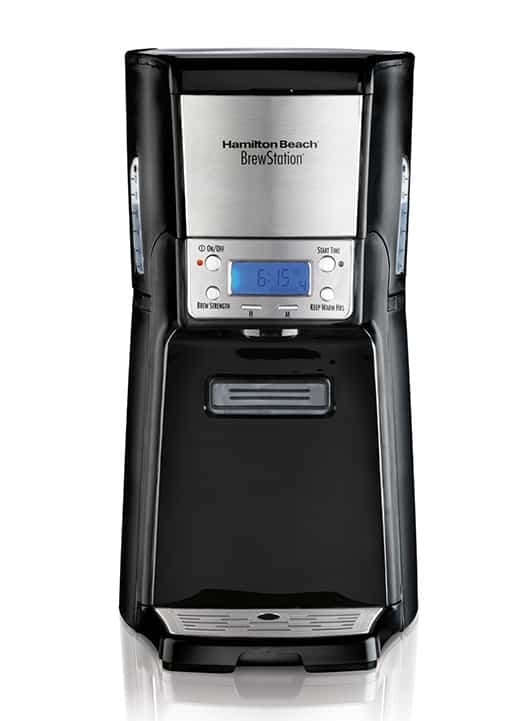 How Does the Hamilton Beach BrewStation Work? Firstly, you use the carrying tank to fill the machine to your desired level. Then add your coffee. Next, you choose what type of brew you want – regular, bold or iced. Switch the machine on and that’s it. You can also programme it to come on at a set time so you can have freshly brewed hot coffee for waking up to or returning from work. The machine is easy to use and the internal storage tends to keep the coffee hot for longer than a carafe would. The lack of a carafe also simplifies the cleaning process – it’s one less thing to clean! The machine keeps your coffee hot for around four hours which is pretty good for these kinds of machines. The coffee has a good flavour with no scorched taste and you can definitely taste the difference between the regular and the bold brews. The lack of carafe – no extra cleaning, no chance of having to replace a broken carafe and the coffee stays hot for longer. The good price – This machine is definitely at the lower end of the pricing scale. The programmable on and off settings: Nothing beats waking up to a good, fresh coffee! The machine has rubber feet which make it hard to move the machine in and out if you keep it underneath your cabinets. If you don’t drink the entire amount of coffee brewed, you can’t just tip it down the sink like you can from a carafe. You have to fill and refill a cup until it’s all gone. Is this machine ideal for me? This machine is ideal for anyone who wants an easy to use machine that still has options. It’s also ideal for anyone a little bit clumsy who has a habit of dropping and breaking their glass carafes! Who shouldn't buy this machine? Because there isn’t a carafe, this machine isn’t suited to multiple people households where everyone likes their coffee differently. So for example, if one person likes a strong brew and one likes a regular brew, or one person likes decaf and the other doesn’t, this machine won’t work well for you. 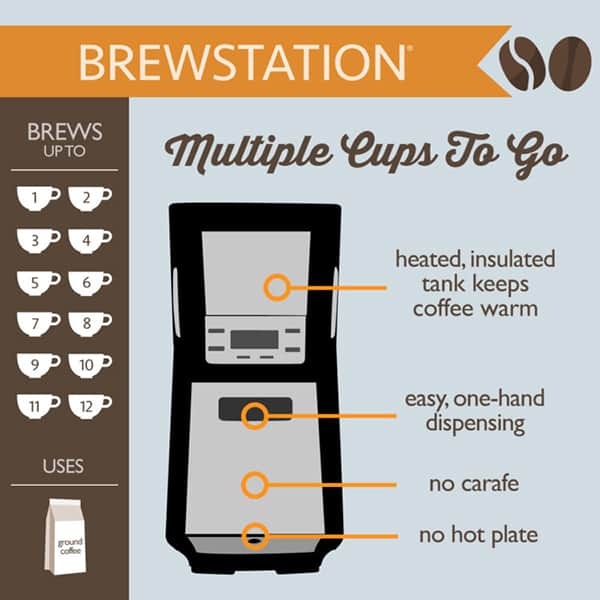 There’s no option to brew two separate pots and both have your coffee your way. Overall, the lack of carafe on this model is a huge plus. It’s a great machine that makes nice tasting coffee consistently and easily. The programmable timer makes it a huge plus for anyone who likes their coffee ready at a certain time. This machine is a good little buy! This machine has no carafe which makes it unique in the drip coffee maker world and is a handy innovation that means there’s no risk of spillages or breakages.